Microsoft's James Hamilton Presents "Where Does Power go in Data Centers and How to get it Back?" James Hamilton has a blog post about his attending O'Reilly's Foo Camp and his presentation on "Where does Power go in Data Centers and How to get it Back?" The title for my session was Where Does the Power go in Data Centers and How to get it Back? I didn’t show slides but much of what we covered is posted at: http://mvdirona.com/jrh/TalksAndPapers/JamesRH_DCPowerSavingsFooCamp08.ppt. In the session, we talked through how contemporary large data centers work first looking at power distribution. We tracked the power from the feed to the substation at 115,000 volts through numerous conversions before arriving at the CPU at 1.2 volts. We then talked about power saving server design techniques. And then the mechanical systems used to get the heat back out. In each section we discussed what could be done to improve the design and how much could be saved. Our conclusion from the session was that power savings of nearly 4x where both possible and affordable using only current technology. For those participated in the session, thanks for your contribution and for your help. It was fun. James comes to the conclusion there is a power savings of 4x. If you are curious as to how he comes to this look at his slides. 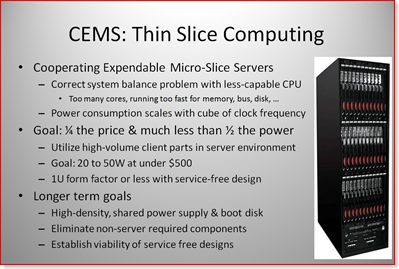 One of his ideas that flies in the face of high density computing is Thin Slice Computing.